Following the outbreak of yellow fever in the Democratic Republic of Congo (DRC), linked to the hit neighbouring Angola in December, Médecins Sans Frontières (MSF) conducted activities in the south-west of the country to stop the spread of the disease. Entomologist Andre Yebakima was among MSF's team who carried out an initial assessment. In a vector-borne disease such as yellow fever, there are three components: the virus, humans and the vector. In this case, the mosquito transmits the virus. To combat the disease, all three components must be considered. The entomologist (an insect specialist) will, therefore, focus on the mosquito. Our goal is to locate the larval habitats, in other words, the mosquitoes' breeding grounds. These larval habitats are varied; for example, they might be small piles of rubbish in a courtyard or garden where a bit of water has stagnated, old abandoned tyres, water tanks, blocked gutters, and so on. In the case of yellow fever, the mosquito species responsible is the Aedes. When it takes the virus from an infected person, the virus develops in the mosquito's body for about 12 days, after which the mosquito can transmit it to a healthy person. Once a female mosquito is infected, it will continue to carry the virus, and therefore be able to transmit it, throughout its life, which lasts one to two months. It can also transmit the virus to its offspring, although not systematically. Without mosquitoes, there is no transmission. So, besides vaccination, eradicating the mosquito is another way to break the chain of transmission. Medecins Sans Frontieres (MSF) staff members fumigate a neighbourhood in Matadi, during an operation to kill adult mosquitoes. 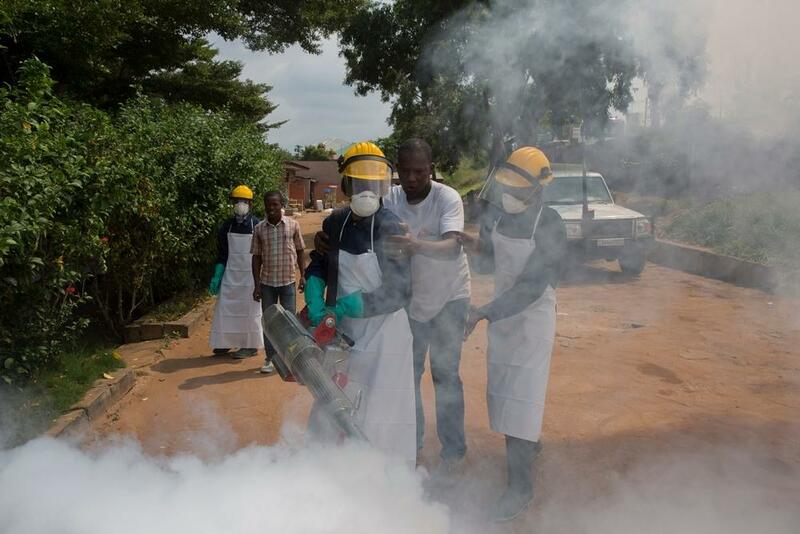 MSF staff members fumigate a neighbourhood in Matadi, during an operation to kill adult mosquitoes. There are several complementary methods. Firstly, people should protect themselves from being bitten using repellents, mosquito nets, long clothing, etc. They should also avoid having anything in or around the house that can hold stagnant water, which encourages mosquito breeding. Lastly, we can use biocides, chemical or biological pesticides. 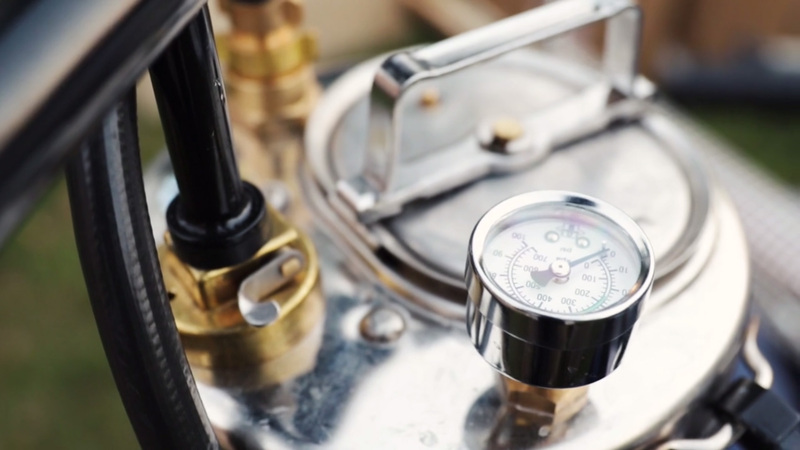 These can be used either in the habitats, where a larvicide can prevent larvae from developing, or by spraying or fumigating homes with biocides that target adult mosquitoes. There is also a recently developed process that involves poisoning the water of a larval habitat. Any mosquito that lands on the water will then carry the pesticide on its legs to other larval habitats where other mosquitoes will then, in turn, be poisoned. Generally speaking, community action and health promotion are essential to explaining the disease, the role played by mosquitoes and what should be done in terms of prevention. 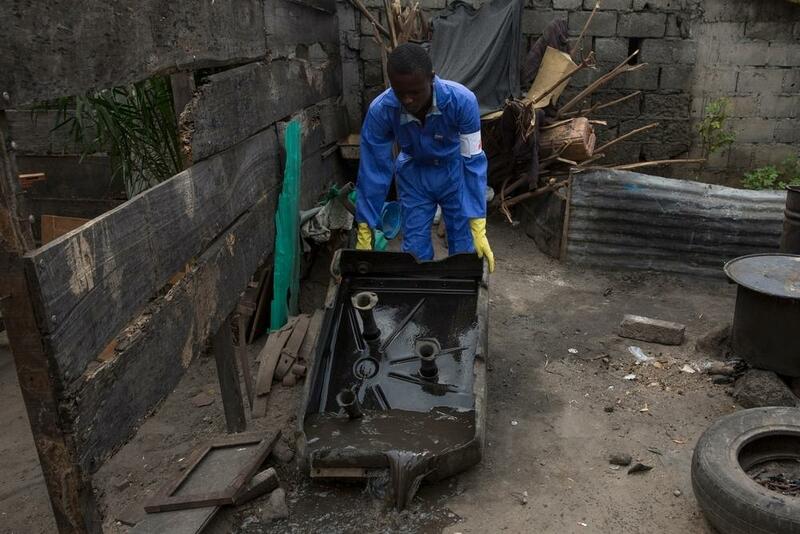 Medecins Sans Frontieres (MSF) staff member empties a water tank in Ndjili area in Kinshasa, during an operation to find and irradiate areas where mosquitoes breed. One case of yellow fever was detected in the neighborhood. MSF staff member empties a water tank in Ndjili area in Kinshasa, during an operation to find and irradiate areas where mosquitoes breed. One case of yellow fever was detected in the neighbourhood. Generally, we have markers: a neighbourhood where there are suspected cases, where the population is denser. Such indicators will help guide us in the field. Once in the field, as we know it is a domestic mosquito that lives near people, we will carry out visits in and around homes to identify areas where stagnant water may collect.In Kinshasa, the primary goal was to assess the vector, the mosquito, by sampling: what species were responsible and where their breeding grounds were. It also involved identifying the local partners that MSF could work with and assessing needs in order to prepare the MSF response effort: human resources, products, equipment, etc. The main finding was the predominant role of people in the creation of larval habitats. From an entomological point of view, indicators show that there is a risk of an outbreak as soon as there are imported or local cases. With the outbreak in neighbouring Angola, the precautionary principle is to take action with, for example, social engagement and targeted actions around suspected cases or vulnerable locations such as hospitals and schools. There will always be areas of stagnant water. The goal is not to eradicate, but rather reduce the mosquito population to such an extent that it greatly lowers the transmission rate.